Deciphering the “what’s what” and “who’s who” of today’s complex financial services industry can be difficult, even for the most financially sophisticated members of the general investing public. Two words — fiduciary and suitability — are critical in understanding the motivation behind the person offering you financial products or advice. Recognizing the difference between the fiduciary and suitability standards may also help you to appreciate the level of care you receive from a trusted financial advisor. 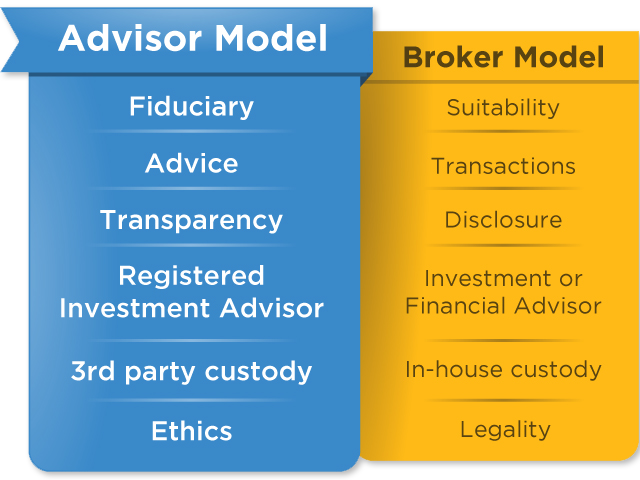 Though the distinction between the fiduciary and suitability methods of offering advice is rarely discussed by large, “broker-led” financial companies, we feel it is essential for investors to know the difference. Our firm believes the fiduciary model of disclosure and transparency is now in the best interests of the client. Offers products for sale from a range of products carried by the company he or she represents. The suitability standard states that a broker only needs to check the suitability of a prospective buyer, based primarily upon financial objectives, current income level and age, in order to complete a commissionable sale of a financial product. In a way, when a broker checks the suitability of a potential buyer, he or she is measuring how much financial product can be sold, not the needs of the investor. No disclosure of possible conflicts of interest is required. Common differences between the two standards involve trading commissions. Every day, financial products are sold for a commission and include internal costs and fees that are difficult to find and define. The dollar value of these commissions and additional internal costs are usually deducted from the amount an investor invests in a financial product. The total return of such a product may therefore be reduced by the value of these hidden costs. To schedule a time to discuss your financial future click contact us or call us at (801) 639-0095 today!